Bundi is our latest passion in India. Visiting Bundi is a must when going to Rajasthan. It is an extraordinary place of unusual beauty with a magnificent fort, a palace full of frescoes covered with gold, a blue settlement that rivals Jodhpur (and we win) and lovely lakes. Bundi is definitely one of the most beautiful places in Rajasthan and India. Dare to visit Bundi and nothing will prepare you for what you will find in this beautiful, forgotten village in Rajasthan? And if you decide to visit Bundi, know what you can not miss and the best tips to prepare your trip. Bundi has lots of attractions to explore whether it is palaces, forts, bazaars or local streets. Rani ji ki Baori, Sukh Mahal, Chaurasi Khambon ki Chhatri, Hath Pol, Taragarh Fort, Garh palace, Moti Mahal, Shikar Burj, Phool Mahal, Jait Sagar Lake, Chitrashala, Indragarh Fort, Dhabhai Kund, Step Wells are the top attractions to visit in Bundi. 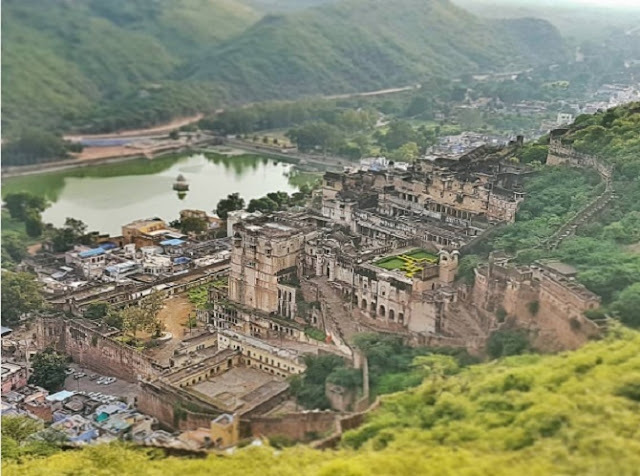 · To visit Bundi, try to stay in a traditional house, the Bundi Inn Hotel, a few meters from the palace and with a fabulous view on the fort from its terrace. It would be a treat for the senses to have breakfast on the terrace as well as dinner. They are surely the best views of Bundi. In addition, the hotel is an old haveli with a colorful elephant statue at the entrance. · At dusk, thousands of bats leave the abandoned wings of the palace and fort and invade the city. It's a memorable show. Admire it from the hotel terrace. You will never forget this moment. · You can dine at the hotel where you will stayed (as it is a good option) or experience the magnificent Out of the Blue, which is now called Morgan's Place. It has a reputation for having the best pizzas in Rajasthan, and it does! Visiting Bundi is worth it! The pizza four cheeses are delicious. It would be so good if you will go there twice. · You will arrive at Bundi by train from Chittogarh (1 hour trip). · There are trains from the main cities of Rajasthan to Kota or Bundi. If you visit Bundi and come from Delhi or Mumbai, the best option is to travel to Kota (main station) and from there to Bundi. If traveling from the cities of Udaipur or Chittogarh, there are direct trains to Bundi. Bundi is also connected to most of the cities of Rajasthan by bus. · A bus from Kota to Bundi costs 30 rupees and takes 40 minutes. There are buses every 15 minutes. · The rickshaw from the train station (10 km) to the city center costs 80 rupees.